Eisenhower Tax Rates - Yes they were 90% - Yes The Rich Paid More. Eisenhower Tax Rates – 90%? Yes! In the lead up to the 2016 election, Bernie Sanders mentioned that the top marginal tax rates under Eisenhower were over 90%. 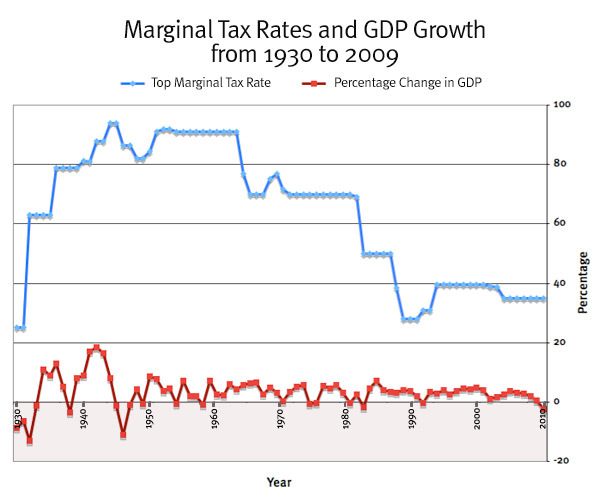 This has lead many wrongly believe that Bernie Sanders himself planned to raise the tax rates to 90%, when in fact he (as others have done) was merely making the point that a 90% top marginal tax rate didn’t seem to prevent economic growth. However, there does appear to be some confusion, and some people incorrectly believe that this was a flat 90% tax rate under Eisenhower and others. A top marginal tax rate simply taxes a certain rate above a set income, rather than taxing the entire income. 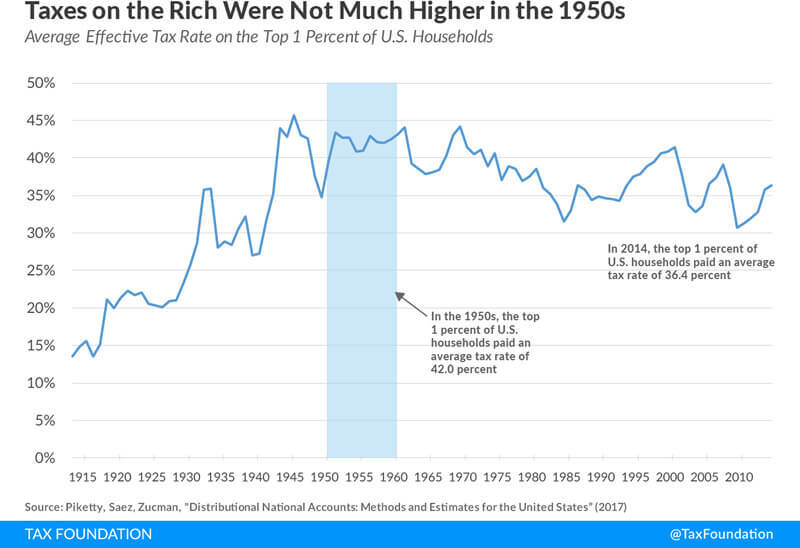 During 1951 the top tax bracket was $400,000 (almost $4 Million in 2017 dollars). So anything above $400,000 was taxed at 91%. In other words, if someone made $500,000, that last $100,000 was taxed at 90%, not the entire $500K. It’s commonly stated that no one actually paid the full 90%, either because they found tax loopholes or they simply wrote off more costs. This is a bit of a non-sequitur as tax loopholes exist today as well, and one can argue that few if any actually pay today’s top marginal tax rate of 39%. Needless to say, people with smart financing will find what tax shelters they can, regardless of the tax rate. 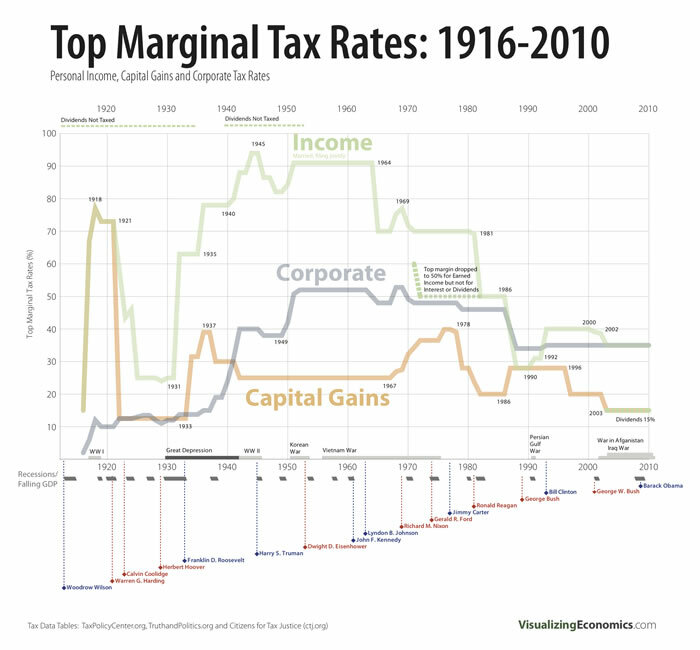 In an attempt to minimize the revenues generated by having a top marginal tax rate of 90% or more, many plays “hide the ball” by comparing the top (statutory) marginal tax rates against overall effective tax rates (as opposed to comparing statutory and effective top marginal tax rates. Here is a more apples-to-apples comparison, as this focuses specifically on effective tax rates for top earners. 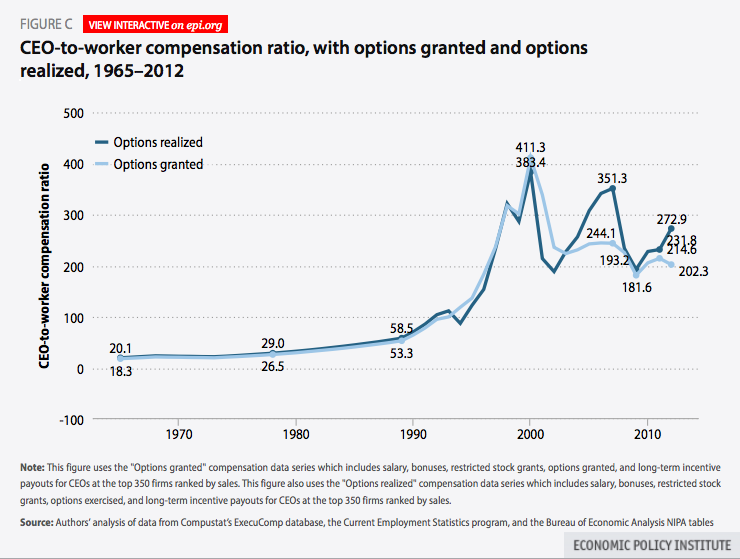 While the top earners were clearly taxed more, even at an effective rate, the disparity is not so wide. Of course, that only takes income tax into account. 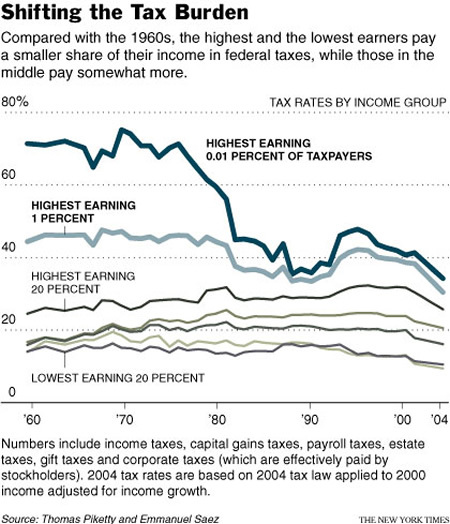 In reality, the top earners are largely making their money from capital gains, and those tax rates are much lower. 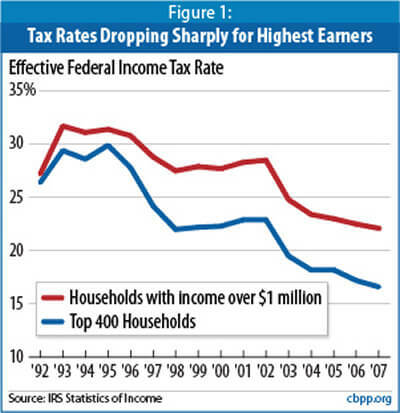 Here is a graph that shows how overall effective tax rates have actually dropped for top earners over the last 25 years. In fact, the lowered tax burden at the top has been partially offset by an increase in tax burden for middle-income earners. More importantly is the effect that so much use of tax shelters had. Such a high tax rate on top earners meant less motivation for CEO’s to make the amount of income they now do since these incomes would be taxed at 90%+. In fact, the lowering of these top marginal tax rates does appear to coincide with rising CEO pay and a median income that continues to fall behind rising costs of living. 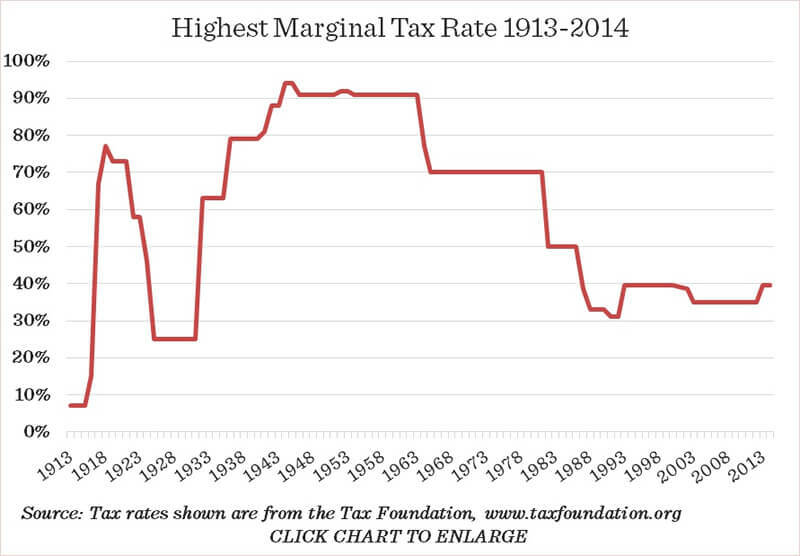 Furthermore, there is no indication that such a high top marginal tax rate had a detrimental effect on the economy. 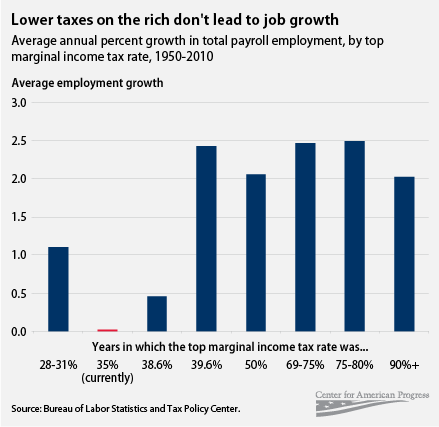 Both GDP and job growth were healthier than under the lower top marginal (and corporate) tax rates of recent decades. Why? Because rather than paying such a high top marginal tax rate, top earners were simply reinvesting money back into the economy (hence, faster GDP growth). The idea of higher tax rates at the top and a healthier economy seems counterintuitive in an information world that’s been dominated by supply-side messaging. However, given human nature, it makes sense. The assumption that top earners would simply invest their money back into the economy because they keep more of it after taxes has simply not held up. Simply put, top earners don’t put all or even most of their money back into the economy (which is essentially what makes them rich). Lower and middle-income earners, on the other hand, do put their money right back into the economy and do so into local, tangible products and services (as opposed to speculative trading or overseas markets). Furthermore, it’s likely that the opposite was in fact true: in order to lower their tax burden, the top income earners simply spent more in order to avoid having to file under the top income tax bracket. As the income disparity widens, the two major parties grow wider apart and the Republican party appears to offer little more than platitudes that have long-since been debunked, or straw man arguments that argue that any mention of record-level income disparity is an attack on wealth, the rich, or a call for equal incomes for all.